MISSION: Provide center of education and information for horse enthusiasts. SERVICE: Access to experts. Response to inquiries about horses. Our "Ask The Experts" site is being restructured and not all the experts are currently available to answer topic questions as listed. Therefore, some questions that are submitted will NOT be posted online with an answer. We will, however, try to email you a reason for the return of your question. click "Topics Directory" on the Navigation Menu at left, or click on the "Information/Help Window" area of picture. To submit a question ('Equestion') to our panel of experts, first check to see if a similar 'equestion' has already been answered by one of our experts ( by clicking on "Topics Directory", then the topics most likely to contain your 'equestion'). 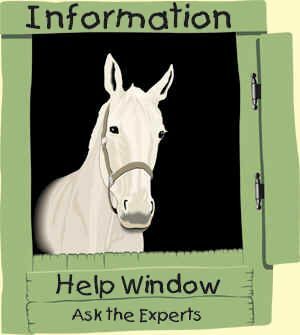 To perform a keyword site search (Ask the Experts, Articles That Educate, News, First Time Horse Owner and Horse Adventures sections) click "Search" on the Navigation Menu. If you cannot find an existing answer to your 'equestion', then click "Submit a Question" on the Navigation Menu at left or click "Ask the Experts" (on the bottom area of picture). Disclaimer: The material presented here is for informational purposes only and does not substitute for the services of a paid professional. By participating you agree to indemnify Equerry, it's associates and experts from any liability that might arise from its use.